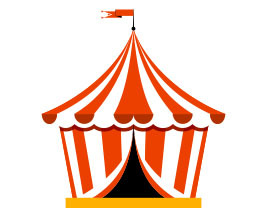 Once upon a time in a world full of smiles and cheers there was an old circus. 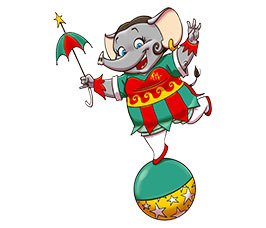 The circus was always shining bright and brought joy to every single person for many, many years until one day, when something unexpected happened and suddenly the dazzling light of joy started to dim and eventually faded forever. The world, once bright and happy, became dark and dull. Smiles from people’s faces faded and they turned into objects with question marks instead of eyes. Everyday life started to catch up with everyone, even the long-time members of the circus lost all hope for bringing back the joy, accepted their fate, put their heads down and followed the flow to infinite boredom. But not everyone gave up, there were four young members of the old circus who still believed that the joy and cheers could be restored in this world: An Elephant – born under a happy star, she was always pretty, always smiling and always positive; a bear – the soul of the company, he was always there for his friends through thick and sin, a tiger – the wisest member of the group, who was a descendant of a family that gave birth to a tradition of entertainment and a happy life in this world, he was also practicing magic since early years. The Tiger had a baby tiger, the youngest member of the circus. It was following the footsteps of his father and was on his way to become a wizard’s apprentice, until the situation forced him to help other members on their mission. They were young and restless, so they decided to become the new icons and symbols for a better world. They called for the public meetings but every single time only three of them showed up. They didn’t stop doing the shows, but nobody attended, so time by time disappointment and frustration started creeping over them. They weren’t displaying their attitude to each other, but for themselves, they started to getting used to the fact that they were doomed for dark days and darker nights forever. Time passed, all of them still did the shows and still no attendants, and one day they decided to close the circus for good. 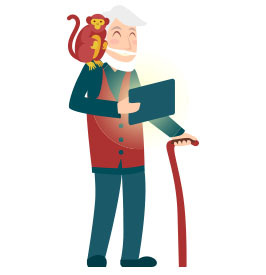 An elder man with a monkey on his shoulder was waiting for them in the streets. The day was snowy, his beard was all covered in white, he was shivering, but still he gathered all the power left and went up to the young entertainers, handed them the map and a letter, gave them a “rare in these days” smile, and without saying anything turned away and disappeared in a thick snow. The letter told the ancient legend of a sad clown, who, in times of despair, when life seemed cruel and harsh, still found a way to cheer everyone up and bring the light back to the world. The letter also included a map, showing a new world, a source of reborn joy and newfound light. Our young heroes didn’t know whether to believe the old man with a monkey. They have never heard neither a legend about a sad clown nor about the place on the map. But they had nothing to lose, they were ready for sacrifices in order to achieve their goal of seeing a happy world once again. So they started their long journey into the unknown. Sometimes times were hard, the darkness wanted to overcome the joy, magic was dying in the veins of baby tiger, but his older friends carried his weight in their shoulders, they never stopped, never gave up, and after millions of steps and thousands of sad faces they arrived to this fairy world. It all looked strange, people weren’t sad, but nor happy, it was neither dark, nor light. But there was part of this world that showed hope, at the east border of this world there was a city, a city of life. The young ones settled at the city and started building a place that resembled their home. They got a huge support from everyone, every single person was putting their smiles and work into building a happy place. They soon became the favorite characters of this large community. 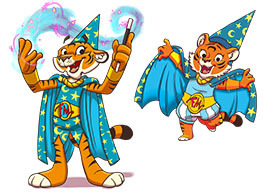 The tiger and his kid resumed practicing magic again and inspired hundreds of kids to follow their lead. 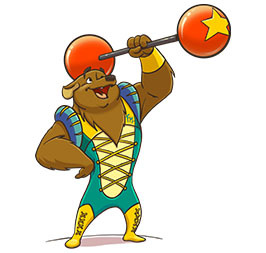 An elephant conquered everyone’s hearts and taught people how to love, the bear quickly became friends with every single person and played a major role in forming a family environment in a world far away from home. Four of them stood still, they were still young and restless, with big smiles on their faces. Focus Mokus was welcoming New Year and a first guest. Smiles were restored in this world, a bright light of Joy was dazzling once again.